For the first time in Castleford's 91 year history as a senior club they finished at the top of the table. After the regular season of 23 games the twelve team league split into the Super 8s at the top, with the bottom four joining with the Championship top four in the Qualifiers to determine promotion and relegation. Castleford finished the regular season at the top, ten points clear and maintained the lead to the end of the season. They were so far in front that the shield was awarded to them after only three games of the seven game series as they could not be caught. 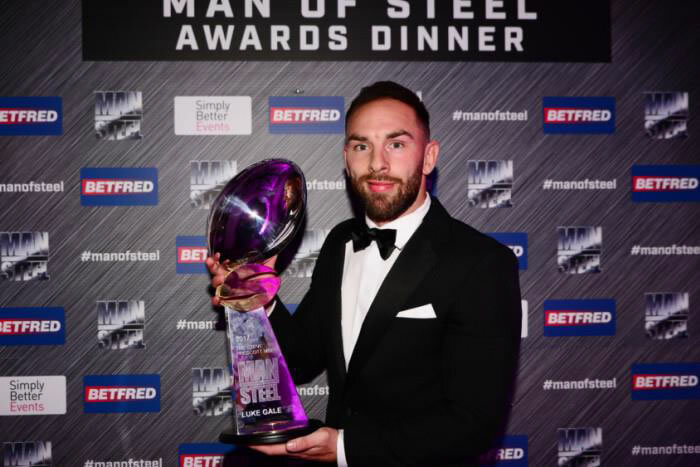 Luke Gale voted Man of Steel and RL Writers Association Player of the Year. He also won the League Express magazine Albert Goldthorpe Medal as Player of the Season for the third consecutive time. The club won the league by a record Super League margin of 10 points and equalled the highest points of 50. It had the best attack and second best defence in the table. The points difference was 284 higher than the next best team. The 2017 season was the one Castleford fans had been dreaming of all their lives. Well almost. 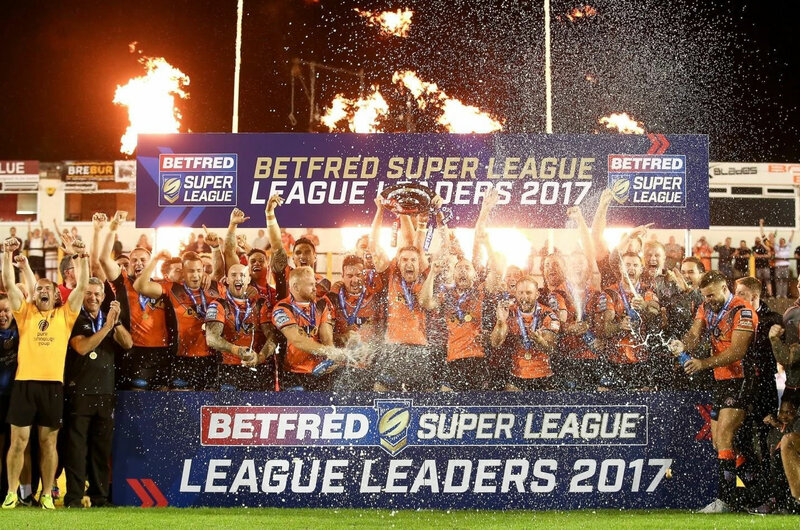 After three years of steady progress under coach Daryl Powell, 2017 was the year the team finally took Super League by storm. They started off with all guns blazing, scoring over 40 points against newly promoted Leigh, followed shortly after by a 66-10 win over local rivals Leeds. Eight wins in the first eleven games put Cas near the top of the table, before Wigan were beaten 54-4 as the team really hit top gear. The Wigan win was the first of nine consecutive wins that put the team several points clear at the top of Super League - a position they were to hold for the rest of the season. During that period left-winger Greg Eden scored 18 tries in just six matches as opposing teams found the left-edge attack of Luke Gale, Michael Shenton, Zak Hardaker and Eden impossible to stop. Eden's five tries against Warrington on 11th June equalled the club record for tries in a match. There were times when the team seemed to be playing a different game to their opponents. Other teams were trying to "win the ruck", get "good field position" and "build pressure", which is an approach teams seem to have been brainwashed into by a generation of Australian coaches. But Cas didn't seem to bother with any of that. They just moved the ball quickly, attacked from anywhere on the field and scored some spectacular tries. When interviewed about their style, Daryl Powell just said he wanted players to enjoy themselves, throw the ball about and entertain the supporters. When asked whether he felt it was a risky way to play he replied that there was no point players practising skills in training if they weren't encouraged to use them during matches. Enough said! Despite a Challenge Cup exit following a defeat at Hull, the league wins continued. Six wins in the following seven matches meant that a win at home to Wakefield on 17th August - a full month before the end of the league programme - would confirm Cas as League Leaders for the first time in the club's 91 year history. After a slightly nervous start, the team duly obliged with a 45-20 win to trigger some memorable scenes at the old Wheldon Road ground. Despite top spot being guaranteed, there was no let-up in performances in the lead up to the Top 4 Playoffs. A fourth win of the season against Leeds included seven goals from Luke Gale, which took him past Bob Beardmore's 33 year-old club record for the most points in a season. Gale was to end the season with 355 points, from 14 tries, 145 goals and 9 drop goals. This win was followed by a second win of the season at Wigan, including three tries for Jake Trueman in his first Super League start. The build-up to the play-off semi-final, a home game against St Helens, did not go smoothly. Although Greg Eden had recovered from a shoulder injury that threatened to end his season, that feared left-edge attack had lost some of its cohesion. Even more of a worry was the potential loss of Luke Gale who had undergone emergency surgery for appendicitis just 16 days before the semi-final. Against the odds, he made a return to fitness and, as things turned out, it was just as well. After letting a 10 point lead slip, it looked like the season was over for Cas as Saints led by two points inside the last minute. But Luke Gale held his nerve to kick a last-gasp penalty to send the match into "Golden Point" extra time. All those who witnessed the match, either live or on television, will remember what followed for many years to come. Both sides failed with drop goal attempts, before Luke Gale sent his second effort through the posts to give Cas a 23-22 win. They were through to their first Super League Grand Final - the club's first appearance in a league title play-off final since 1994. Having overcome the upheaval caused by Eden's injury and Gale's surgery, the preparation for the Grand Final suffered an even greater blow when, just two days before the final, news emerged that Zak Hardaker would not be playing, having failed a drugs test a few weeks earlier. In the circumstances, the final proved to be one step too far. It rained all day and continued to rain all through the match. Cas didn't perform, but were beaten more by the occasion and the weather than by their opponents. But looking back now, that final match seems almost irrelevant. The season had still been the best in living memory for the majority of the club's supporters. The way the team had played had made everyone proud to be a Cas supporter. 2017 was "Classy Cas" with knobs on. In the words of Neil Diamond, good times never seemed so good. A number of spectacular long-range tries: Luke Gale at Warrington; Greg Eden at Wigan; Zak Hardaker at Headingley to name a few. Generally, just the way the team played for the whole season made my favourite moment last for seven months, almost without a break. At last somebody had the nerve and the imagination to break the mould and play in a different way. I was so proud it was Cas! Watching the League Leadership decider against Wakefield in a hotel bedroom in New Zealand at 6.30am local time. When we arranged to go and see our daughter, it never occurred to us that they would win it before we got home! Then getting a phone call from my 28-year-old son at the ground at full time. He admitted he had shed a tear but said it was ok because nearly everybody around him was doing the same thing. Having watched the team home and away since he was 6, this was the first time he had actually seen them win anything. Thanks boys! But my absolute favourite moment was the 16-12 win against St Helens. This was a much weakened Cas team, including several fringe players and Kieran Gill and Jake Trueman playing their first games in Super League. Saints were at full strength but eventually came off second best. It was not just about having the will to win. It was about having a bloody-minded refusal to be beaten, and this win, more than the numerous big scores, convinced many observers that this team was the "real deal". The 2017 season was brilliant for Cas fans worldwide, and believe you me our fans are everywhere!! My two sons have been serving overseas all season with HM forces in very far flung places, and so find Harvey Wiles' commentaries online are an absolute lifeline for a Cas fan. My regret is, as lifelong Cas fans they didn't see any live matches, but thanks Harvey for your efforts. I am so proud of the whole season regardless of the odd bad result. Cas learned the ability to bounce back, and watching our team play made you realise they had the mindset and ability to do "IT" this last season. Confidence was so high we never doubted the team, and Daryl's ability to keep them at the top. At the home game against Wakefield when we won the League Leaders Shield, a small group of Canadian people stood behind us, and explained that they were staying in the area and had been told to come to the match because something very special was going to happen here tonight!! AMAZING!!! They loved it too. A changing of the guard at the top of Super League even got our sport talked about on BBC Breakfast, and that's unheard of. They even talked on there about a man in a corset who had just had his appendix out winning us the match against St Helens, of course Luke Gale. There were times when the play was sublime and took our breath away completely leading me many times to say out loud to whoever was listening at the match "Crikey we are so good". We fell at the last hurdle at Old Trafford but nevertheless I loved the whole experience of the day as I had never been to a Grand Final before, and wanted to support my own team whatever happened. All I can say to the whole Castleford Tigers club and staff is thank you so much for the memories. I will never forget your achievements this 2017 season. The best season with the most entertaining rugby seen by anyone for a long, long time, be you a Cas fan or not. It's been a pleasure to be part of it all. In fact it's been absolutely awesome! If I were to say it had been a fantastic season, that would be the understatement of the year. Dave Williams and myself provided almost all the coverage, but on occasions we had the help of my son Mark, and Mick Gledhill to help out to provide the service. League Leaders Shield Winners, what an achievement. OK we lost in the Grand Final to arch rivals Leeds Rhinos, in what was probably our worst performance of the year. We did beat them on four occasions during the season, but it was still a bitter pill to swallow the Grand Final Defeat. With regards the Tiger Talk Radio aspect, we have gone from strength to strength, capitalising on our ability to produce full uninterrupted commentary on every game (well almost, we didn't go to Catalan, and the Hull Super 8 game, we were both away), but other than those two we provided full match commentary (wi-fi permitting) on all the other games. The listening figures were affected when we were on SKY TV, which was to be expected, but when we were not on TV we captured a large chunk of the listening market, and now have several thousand regular listeners to each game, listening from over 100 countries throughout the year. Lots of those would be holiday makers in the Canaries and Florida, as the application for broadcasting shows where all the listeners are. Qatar was a regular outpost for a listener, many in Australia and New Zealand were early morning listeners, the Caribbean was a popular listening venue, as was Castleford on a cold wet and windy Friday night. The official figures provided were that we had over the season 35,000 devices tuned in with total listening minutes of 2.3 million from 102 countries. Amazing really, as we are not really known in Castleford, let alone the rest of the world! We need to spread the word about this fantastic service, which at the moment is a free download application for mobile phones, PCs and tablets. We also provide a twitter response to mine and Dave's personal twitter accounts, and try and respond with mentions to anyone who asks. We have our regular listeners, none more than Diane Howard, who I am sure a lot of you know. Diane is not in good health at the moment but is a true stalwart of the club, herself providing IT help for the Club for many years until recently. There were many more ups than downs recording, also many more cold and windy days than warm and sunny ones - who says summer Rugby was to be played in summery conditions? Battle of Hastings against Leeds 10-66, as Franki Vallli said "Oh what a night". Not spectacular, but nevertheless an important victory at that time of the season, and in a Steve Gill interview, one of the best victories of the season. Depleted with international call ups and injuries, it was at Huddersfield with a 16-24 victory. There were so many good games to commentate on, but those are my favourite 10. You may wonder why not Cas v Saints semi-final play-off. Unfortunately I was on holiday for that one. Scores level at full time won in golden point by a Gale Drop Goal. Harry Sunderland Trophy Winner McGuire. On the Thursday before the game Hardaker was dropped from the squad after testing positive by UKAD for taking cocaine. Luke Gale finished the season with 355 points a club record. Stats kindly provided by the Garbett family.